Practically nothing was known about the biology of whale sharks up until about 15 years ago. Since that time there has been a veritable explosion of interest in the world’s largest fish. As we have learned more about them, some surprising aspects of their life history have emerged, including a tendency to be far more associated with coasts than previously thought and a propensity to gather in quite large groups when conditions are right. Combined with their gentle demeanor, these have opened whale sharks up to becoming the subject of ecotourism activities in those places where they occur reliably, such as the Philippines, Australia, Mozambique, Kenya, the Maldives, Belize, Honduras and Mexico. While it’s wonderful that people want to experience whale sharks first hand, these ecotourism industries are not without their challenges and in some cases they can develop problems so severe as to threaten the viability of the industries and sometimes even the whale sharks themselves. I hope the following three examples illustrate my point. Cebu, Philippines. Whale sharks are well known visitors to the Philippines and an ecotourism industry has been in place around Donsol in Sorsogon province for quite a few years. By most accounts this is a reasonably well-regulated affair with an enforced code of conduct for ecotourists and business operators alike. More recently, however, whale sharks (called “butanding” in Filipino) have begun to aggregate around Oslob in Cebu province and the situation there is a bit different. Most importantly, the Oslob whale shark aggregation is not entirely natural. Itinerant sharks first began showing up around artisanal fishers who were collecting krill at night time, presumably for making shrimp paste. Over time the fishers learned that they could hand feed the sharks with portions of their catch and eventually the fishers began retaining the catch from the night before and taking tourists out during the day and baiting whale sharks with krill. 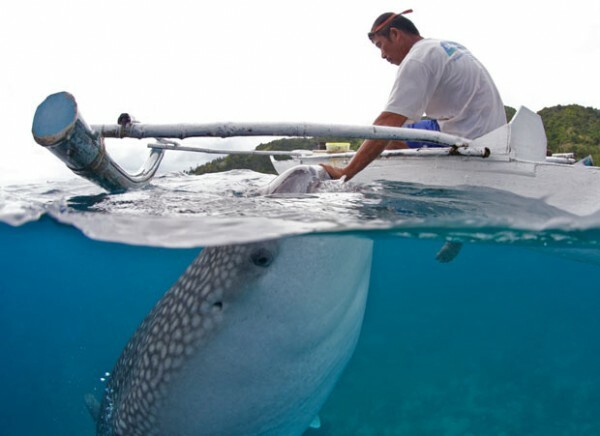 A Cebu fisherman hand feeds a whale shark. Click image for source. Any ecotourism opportunity that is based primarily on baiting a wild animal in this way is destined for controversy, and for good reason. It’s not a good idea to have wild animals becoming dependent on people for food, nor is it wise to interact with them so closely that they lose their natural wariness of people. This second point may be of less concern for whale sharks, which as far as I can tell are fairly indifferent to the presence of people (although not so with krill!). The absence of a regulated industry in Cebu has also led to some prominent instances where people’s conduct around the animals has been less than ideal, the most famous of which involved a photograph of a small girl smiling as she stands on the back of a whale shark stranded in shallow water. More recently, one of the well-known animals was injured by the propeller of a boat across the eye (which may or may not have been destroyed, it’s hard to tell because whale sharks can retract their eyes into their head). There seems an urgent need in Cebu to evaluate how ecotourism is occurring there and even whether or not it should. If the fishers stopped putting out krill, would the sharks move on? It’s hard to say, but in the meantime the Cebu experience seems to be at best ethically dubious. Yucatan, Mexico. The situation in Mexico is quite different from the other two examples. Whale sharks have been known as regular visitors to the coast of the Yucatan peninsula for many years, most famously around Isla Holbox on the Gulf of Mexico side of the peninsula. There, a fleet of pangas would take tourists to swim with a natural aggregation of whale sharks (usually 20-50 animals) that would come there each summer to feed in plankton rich waters around Cabo Catoche. In more recent years, however, the whale sharks have been aggregating on the Caribbean side of the peninsula in an area to the east of the National Park island of Isla Contoy and not far from the major tourist destination city of Cancun. This event is much larger and is, in fact, the largest aggregation of whale sharks anywhere in the world, with 300 or more whale sharks in the same place on some days. The animals come to feed on tuna eggs and they offer a spectacular ecotourist experience because the “afuera aggregation” as it is known, involves so many animals and takes place in warm, clear, blue offshore waters. The first problem is that the proximity of the 900lb gorilla that is Cancun provides an effectively unlimited scope for growth in the ecotourism industry, which is otherwise self-limiting in smaller towns such as Holbox. The second problem concerns jurisdiction; the afuera location is not inside any National Park boundary and it is not always clear which state or federal agency is responsible for the stewardship of the animals. The combination of these two factors has led to an exponential growth in the number of ecotour operators and the number of boats visiting the aggregation, and a reliance on self-regulation which is, frankly, failing. It is rapidly developing into a classic Tragedy of the Commons scenario, in which the competing interests of individual operators inevitably overwhelm their common goal of protecting and preserving their livelihood, eventually resulting in the destruction of the very resource on which they all rely. It’s important to note that this is not taking place because people are callous or uncaring; I know lots of ecotour folks and they are generally passionate and kind. It is simply an emergent property of any group of people exploiting a common resource for individual benefit without a system of controls in place. These situations require some regulatory intervention, which is where the jurisdictional issue is hampering progress towards sustainable ecotourism in Mexico. Until these issues are resolved, the number of boats seems to keep growing and the risk of injury to whale sharks and even tourists themselves creeps inexorably higher as the density of sharks, boats (=propellers) and people in the water increases. I sincerely hope it does not become one of those situations where a disastrous accident is required to elicit action. One thing that is desperately needed is a better understanding of how ecotourism activities affect whale shark behaviour and natural history. I intimated above that whale sharks generally seem indifferent to the presence of people, but there are some data that suggest a decline in both number and mean size of whale sharks at at least one popular ecotourism site in Ningaloo, Australia. I don’t think we can afford a “no news is good news” approach to this issue; the scientific and conservation community really needs to get out there and gather some hard data to help answer these questions and help the regulatory authorities to make better decisions about how to manage these industries. How exactly might we do that? What would we look for? These will be difficult questions to answer when so little known about whale shark behaviour as it is, but answer them we must. In all three examples above, and in ecotourism generally, I think it’s important to celebrate people’s passion for experiencing nature first hand and their willingness to spend their tourist dollars to do that rather than other, shall we say, less substantial tourist activities. There’s also nothing wrong with businesses developing to serve these needs and with people making a living and succeeding as a result of their hard work. But neither of these things should be allowed to go unchecked if it comes at the expense of animal (or human) safety. If they happen anyway, then we really need to take a long hard look at ourselves and what we are calling “ecotourism” and ask if we are really achieving the dream of enjoyable, sustainable, safe and lucrative industries based on the wonders of nature. Share the post "Whale shark ecotourism: the good, the bad and the ugly"
What about Ningaloo, Exmouth Australia. I AM an Aussie, so trust me, I won’t ever forget :) I actually didn’t include Ningaloo because it isn’t showing some of the more severe problems that plague the industry, except for the observed reduction in mean size, which was one of the links in my article and I’m not sure there’s evidence to blame that directly on ecotourism yet. Do you know an ecologically responsible whale shark tour company in Holbox. We’re about to go and I’m worried. Geraldine, I just took a trip there in early August. We booked a trip with whale shark daddy. It turns out WSD is a consolidator, and there are many individuals/companies that they book with. All in all, it seems like all the operations are pretty standard, so I wouldn’t be able to recommend one over the other. They all leave the dock about the same time in the morning, go to the same location, and turn around and come back in at about the same time. We did get an extra snorkeling trip in the Park on the way back. As described above, while it is amazing to see all the whale sharks aggregated in one place and feeding, I found it quite disturbing how many boats were out there at the same time. I would estimate there were 30-40 boats with 5-10 people per boat while we were there. The captains do seem to be able to keep the boats away from the sharks and people, but it definitely takes away from the whole experience, and you wonder what affect it is having on the animals. If not propellers, pollution from all of the outboards, stress, etc. There are rules that the operators are supposed to adhere to, such as, you must wear a life jacket or wetsuit while in the water. It seemed like everyone I saw in the water was adhering to the rules, but our captain said it was because there was enforcement out that day. Plus the captains are likely to report each other because it has gotten so competitive. Our captain, being from Isla Holbox, told me that since they have been issuing permits to operators out of Cancun, the scene has gotten out of control. He thought the number of boats should be limited. If you’re already booked, I’d say go for it, but be prepared for a not so peaceful experience with the whale sharks. They are amazing. Is your name actually para sight because I need to use your name in a works sighted for my essay. No, it’s Alistair Dove. Just click on “Our Writers” at the top of the page to learn about who writes for this blog.